There’s nothing like the sweet, sensual scent of a gardenia in bloom. Like many beautiful things, these plants require extra care — but the benefit of the soft, delicate flowers and delicious fragrance can far outweigh the extra time and attention they need. Because gardenias thrive on daytime temperatures between 68 and 74 degrees (nighttime lows of 60 degrees) and high humidity, they have to be grown indoors in northern New Mexico. They prefer a spot with bright sun, but avoid direct sun, especially in summer. If they get too warm, they may not set flower buds. 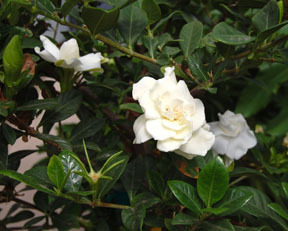 While gardenias love humidity, their foliage does not like to be wet. Misting the foliage can lead to leaf spot fungal problems. 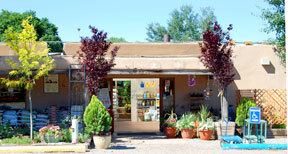 Keep the soil uniformly moist, but don’t overwater, especially in winter. They prefer slightly acidic soil, so we recommend using a nonalkaline soil. Apply an acidic fertilizer in March, July and November. Probably the most irritating problem with gardenias is “bud drop,”when flower buds abort just before blooming. Common causes include low humidity, over-watering, under-watering, insufficient light high temperatures, rapid temperature fluctuations, cold drafts or change in plant locations. It’s true that gardenias have fairly stringent requirements, but the right amount of tender loving care can produce great results.